Jordan Schelling of MLB.com reports Bowling Green native and Milwaukee Brewers outfielder Corey Hart will start Tuesday’s game for the National League after elected starter and Braves’ outfielder Jason Hayward was removed from the roster with an injury. Hart will also participate in tonight’s State Farm Home Run Derby. 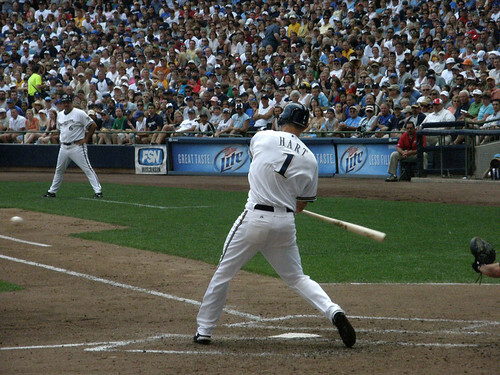 The Associated Press reports the Brewers will knock $1 off the price of tickets in one section of Miller Park for two select games for each home run Hart hits during the Derby. Tyler Kepner of The New York Times lists Hart and former Morehead State University pitcher Jon Rauch among his list of unsung 2010 stars. In Sunday’s MLB Futures Game Lexington native Ben Revere was 0-3 for the U.S. team, which defeated the World 9-1. Former Eastern Kentucky University left-handed pitcher Christian Friedrich retired the only batter he faced, and former University of Louisville right-handed pitcher Trystan Magnuson surrendered one run in two-thirds of an innings for the World. Louisville Bats first baseman Yonder Alonso was 1-4 for the World team. Richard Griffin of the Toronto Star profiles Magnuson and writes the Canadian owes much of his success to his uncle, Chicago Blackhawks defenceman Keith Magnuson, and former Blue Jays pitching coach Mel Queen, who was influential in Roy Halladay’s career.